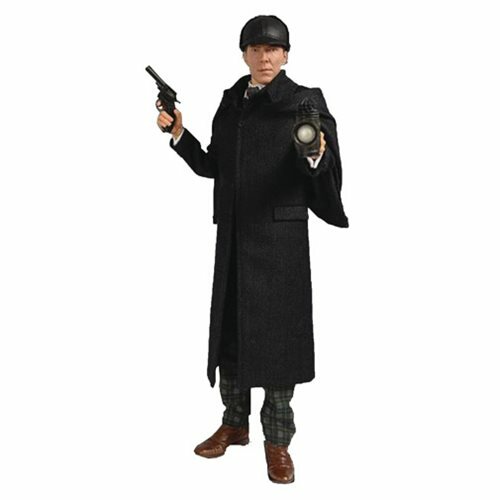 Fully articulated, 12-inch tall Sherlock Holmes action figure! Features an authentic likeness of actor Benedict Cumberbatch. Based on the "The Abominable Bride" episode of the TV series Sherlock. He comes with a fabric outfit, interchangeable hands, and a variety of accessories! This extraordinary Sherlock Holmes Abominable Bride Sherlock 1:6 Scale Action Figure is a fully articulated figure featuring an authentic likeness of actor Benedict Cumberbatch. Holmes is outfitted in a tailored Victorian 3-piece suit, caped overcoat, and his deerstalker hat. He comes with interchangeable hands and a variety of accessories from the "The Abominable Bride" episode of the TV series Sherlock. Sherlock stands about 12-inches tall and includes a display base. "The Abominable Bride" is a special episode of the British television program Sherlock. As part of a psychoanalytic hallucination, Sherlock is transported back into the Victorian era to solve the crimes that no one else could. During his hallucination, he encounters the impossible - an undying "ghost" who returns to murder specifically targeted individuals. After various deductions, help from his engorged and be it greedy brother, and several reality checks, Holmes deduces how to solve the case and reveal the real murderer.